SIU MAI These steamed pork dumplings are among the most popular and recognizable dim sum dishes. On a cold day, the front door and windows of Beacon Hill's Dim Sum House fog up quickly. Steam—rising from the many bowls of congee, plates of chow fun noodles, and baskets of steamed-to-order dumplings that fill its cozy dining room—travels through the air and clings to the glass like a moist kiss. When you walk in, you are welcomed into the modest restaurant's warm, soy-sauce-scented embrace. There are a few restaurants near and around the city that, along with comforting, reliable food, offer a particular sense of place, right down to the regulars who occupy the chairs and barstools. There's the chipped beef on toast and salty service at Chelan Cafe, which, tucked underneath the West Seattle Bridge and near the shipping containers and rail yards of Harbor Island, has long been a second home to longshoreman and other workers. Randy's Restaurant, open 24 hours a day on East Marginal Way in Tukwila, is an enduring pink-and-orange testament to the many people who, fueled by its chicken-fried steak and meatloaf, built the region's aviation industry. Dim Sum House, located on mid Beacon Hill, holds the same sort of charms. It's a delicious snapshot of its neighborhood, a diverse, affordable, and residential area mostly inhabited by multiple generations of Asian American families. Here, the circular tables are filled with families loudly talking to each other in Tagalog or groups of older women gossiping in Cantonese. Flanked by two bustling grocery stores, Fou Lee and Seattle Super Market, its menu is built from the same ingredients that line their shelves and bins: white rice, ginger, scallions, wheat noodles, black mushrooms, chicken feet, chili oil, dried shrimp, and Chinese barbecue pork. Dim Sum House is a diner for those who would be just as happy, if not happier, to tuck into a bowl of rice porridge with sliced fish as a pile of eggs and hash browns at breakfast, or to nibble through steamed pork spare ribs with fermented black beans rather than a BLT for lunch. Instead of the usual process of choosing items off carts being pushed through the dining room (which would be impractical, as the restaurant consists of only 12 tables), you simply order dishes such as shrimp balls, barbecue pork buns, and sesame balls, which are then made to order. Obviously, by doing dim sum this way, many dishes have to be made in advance and then frozen or refrigerated. This fares better for some dishes than others. Xiao long bao ($4.10), the famed soup dumplings that inspire devotion in eaters across the world, are disappointing here. The dumpling wrapper is thick and mushy, and the soup inside, rather than being fatty and rich, is watery and tepid. Much more satisfying are humble turnip cakes ($2.70), custardy white squares made from grated daikon radish and rice flour that, after being steamed, are pan-fried. The exteriors are crunchy and dotted with plenty of salty brown bits, but the insides are impossibly creamy, earthy, and sweet. Crispy, deep fried BBQ pork and deep fried lotus cake dim sum. A general rule here: Order items with crispy edges (aka fried foods) and, most importantly, embrace the oil. Honey walnut prawns ($3.10), encased in a crackly, golden crust, come dressed with dollops of a sticky-sweet mayonnaise sauce. As the sauce softens from the heat of the prawns, it languidly disperses itself, coating everything on the plate in its delectable goo. Fat, meaty wedges of purple-skinned eggplant ($3.10) soak up the oil of the deep fryer like a heavenly sponge; they're lightened by the pink cloud of minced shrimp stuffed inside. You get the sense that the fryer at Dim Sum House has known many types of food in its lifetime; it imbues everything it cooks with a sort of inter-special savoriness and depth of flavor that spans generations. Of course, there are exceptions to every rule, and a few steamed dishes shine. Big, brawny siu mai ($3.10) hold mountains of ground pork and shrimp that burst out of the top of their wrappers like a volcano, juices running down the sides like rivulets of lava. Beef tripe ($2.70), boiled into slippery submission, is wonderful—delicate, tender waves that glide across the tongue along with soft tangles of carrot and ginger. It's a good reminder that some of the best food comes from the most humble ingredients, prepared simply. Dim Sum House operates with a skeleton crew, which no doubt helps keep prices low. Service is, above all, efficient—but always friendly and kind. There's one woman who acts as server, expeditor, busser, and cashier for the restaurant's dozen tables, as well as one person in the kitchen. Together they execute a large menu with a range of mostly Cantonese dishes, but if you want sweeter, American-style Chinese dishes such as General Tso's chicken or even chicken teriyaki, Dim Sum House has got you covered, too. But this is the sort of place where, even though the menu is big, you find the things that you love and stick with them. For my own family, those dishes include sui kau noodle soup ($6)—a light seafood broth filled with thin wheat noodles and fat parcels of dough stuffed with chunks of pork shoulder, little shrimps, and crunchy bamboo shoots—and the sliced fish congee ($6), supple pieces of mild fish floating in thick, almost milky, rice porridge. It's a dish as uniformly white and comforting as a down comforter. I can never bring myself to leave Dim Sum House without ordering the pan-fried shrimp and chive cakes ($3.10), bumpy and bulky with their generous fillings of chopped shrimp and bright, fresh chives. The slightly translucent wrappers, chewy with tapioca flour, are given a welcome crunch by a smattering of sesame seeds that are added before they hit the hot pan. The cakes arrive on a little plate, atop a white paper doily, which makes them feel like a special gift. Meals here can feel like an indulgence, but they never are. 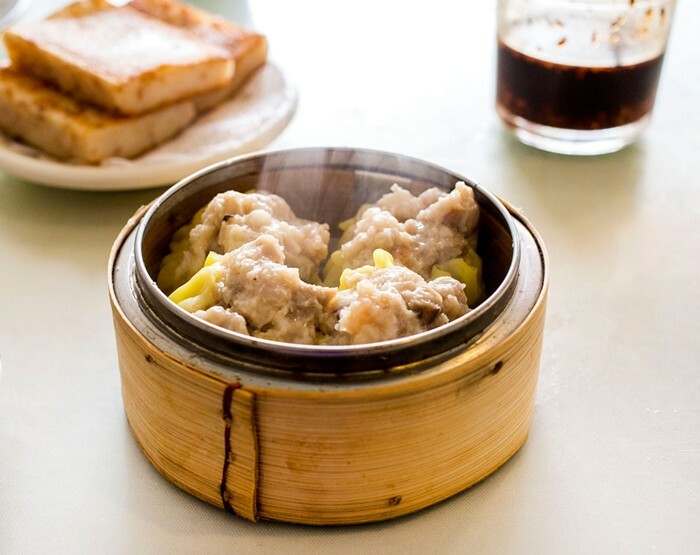 At its heart, Dim Sum House is a neighborhood restaurant that gives its residents exactly what they need: an affordable meal. It speaks to Seattle's immigrant communities that continue to make do with limitations of size, location, and resources, even as their rich flavors and traditions influence the culinary culture of the city at large. Newer neighborhood restaurants—I'm thinking of family-friendly places like the Central District's Peloton, Fremont's Vif, and Ballard's Stock—still strive for the same goals of older restaurants like Dim Sum House: meals that feel necessary, that nourish with a sense of community essential to the city. Even Stock, a place that bills itself as a farm-to-table cafe, has chosen to make congee one of its staple offerings. Diners may seem like relics of the past, but across cultures, we're all still striving for the same, simple comfort, especially in these uncertain times.